Isn't it awesome? Just the thing to hang in my sewing room. Of course, I am now consumed by curiosity: who drew this? Why? How did it end up in a junk shop in Park Slope, for Kate to find? It's marked "DeZine Studio, 105 W 40 ST. NYC", and the style number is D-1725. The illustration is marked "Peau de Soie" (and it's spelled correctly!). Anyone have a clue for me? I could just *invent* the story, a la "Secret Lives," but I'd like to take a stab at finding out actual facts, first. Is there such a thing as a too-big pocket? 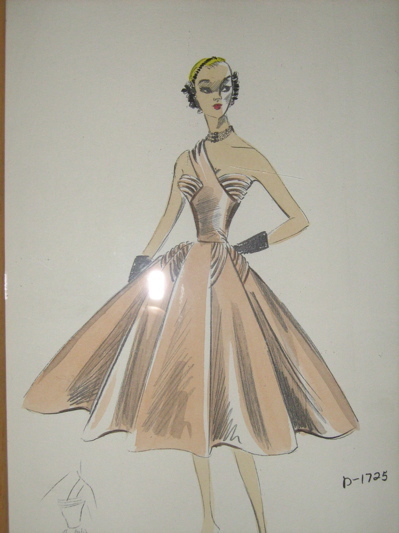 my boss has a sketch of a different dress, same style of sketch in her office. it was a gift as well, so she doesn’t have any info on it.when exactly is your birthday? never mind, i went back an entry.HAPPY BIRTHDAY!!! Erin – Happy Birthday! Mine was yesterday and I would consider another chapter of Secret Lives a most wonderful birthday gift! Oh Wow! I want your sister as a sister! I love the sketch! I don’t know any info on it, but I wish you luck with your search. i love that dress! it’s fabulous! Can we please have another “Secret Lives” anyway? Please? I’m more curious if it ever actually got made up than who drew it. That dress is gorgeous! YOWSERS that is amazing! I tried to do a bit of sleuthing and did NOT find anything exactly like this, but DID find a gorgeous 50’s Vogue Special Design pattern (that looks like it sold for $50 last year) with a SIMILAR ruched bodice. At least it has a pattern number attached so maybe no day in your journeys, it will surface!http://www.lulusvintage.com/ephemera/index.html and it’s the 4th or 5th entry down. Good luck with more googling, guys & gals! I’m off for a nap. This heat’s unbearable..
Jan 1958, in Oxnard California…A dress shop called DeZine Dress was robbed of $708.90 in merchandise. The shop was on 2207 Ventura Blvd (which now has me humming that song. )Perhaps your sister has traveled back in time to swipe you a present. But is it shoplifting if it is done through time travel? What a wonderful present! The dress is soooo divine. I would make mine in a gunmetal taffeta, and go for a night out at the steak house, with a Manhattan to drink. Happy belated birthday! Oh, and thanks for the tape measure that arrived the other day, which now lives in my purse. Would you wear a necklace with that neckline? I don’t think I would. I think I’d do earrings and bracelets. Happy birthday.A beautiful present. Peau de Soie is French and means skin of silk and is referring to a medium weight smooth with a semi dull finish. Originally made in Padua Italy. Ooh, renee, I received the best compliment of my life in a gunmetal taffeta dress. A man I had worked with for months (though I must admit, he had usually only seen me in scrubs, an OR cap and a mask) saw me at a formal occasion wearing a gunmetal taffeta dress and asked a mutual acquaintance, “Who is that incredibly attractive woman?”Being a shy person of dubious self-esteem, it warms my heart that at least once in my life I was thought to be “incredibly attractive”. ‘Maybe ONE day’. Not maybe no day. Geesh, that was a sly negative statement, wasn’t it?! …yes a LOT of fabric, how wonderful to feel all that floating around you? 🙂 If I made it, I’d think of a rich maroon, or maybe forest green? I have an enormous portfolio of my Mom’s watercolors that look like this. She was 15 when she began doing them – amazingly talented! She entered contests for local department stores, too, and I have those “entries” also. One day I want to have some of them framed and hanging in my sewing room – this is just the inspiration! Thanks for sharing! Geesh – I checked out your sister Kate’s site — is the ENTIRE McKean Clan amazingly talented and brilliant? Ever since I’ve been watching “Mad Men,” dresses like this fill me with a certain tristesse. (Hey, if it’s in “peau de soie” I can refer to my mood as “tristesse.”) When I look at these garments’ tight, unforgiving construction, and their extreme exaggeration of seondary sexual characteristics, I can’t help thinking how women were defined by their gender in the 1950s, subordinated to men, and profoundly unfree. There’s a Max Ophuls movie, called “The Reckless Moment” with James mason (it was remade as “The Deep End” with Tilda Swinton a few years ago) that uses these tight, highly structured 1950’s-era dresses to make a point about how suffocated the heroine is by her role as wife and mother.But if I could look at the garment as nothing but a garment, deracinated from history, it is very beautiful. ooh ooh ooh – Secret Lives are so much better than “actual facts”! Believe it or not, I saw a similar drawing on the wall in the ladies room of a furniture store this past weekend. The subject was wearing a two-toned kimono sleeved jacket and a pencil skirt, and the drawing was labeled: “C26-250, Helene E. Simke (or maybe ‘Sinake’), DeZine Studio, 1054 40th Street, NYC”. 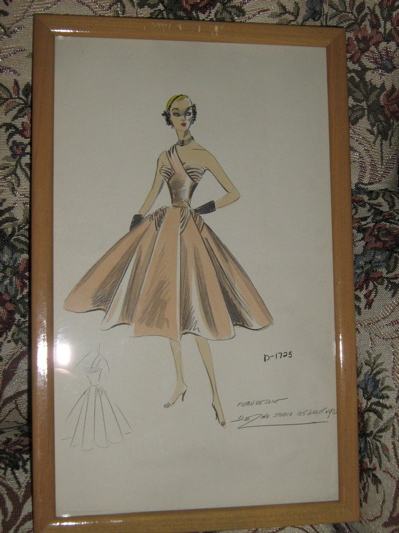 The drawing and the location raise the possibility that this might have been (DeZine Studio might have been…) costume designers for Broadway shows. Anonymous’s post on gender roles reflected in dresses, along with the dress design, remind me of a post on Go Fug Yourself this week with a dress that has a scarf that reaches up from the bodice to wrap around the nick. On first glance I thought this dress was similar (now I see that it is a necklace worn with it). I’ll drink to modern day freedom to wear either slacks or froufy dresses. She was my grandmother, Oma! I just found 9 of these renderings from apparently the same artist at an estate sale in Chicago. I have 6 of these drawings, cannot recall where I picked them up, but it was a thift store, or maybe the flea market in NY. I am a thifter and flea marker stalker. I cannot find anything about these mystery drawings, but they are framed and in my bedroom..
DeZine Studio was at 110 W. 40th St. on the 11th floor. Helen E. Simke retired in about 1970. I’m glad so many of you like my mother’s work. Would you like to see more? I’d be happy to post a few. Hello to all interested in this fashion sketch. I am now doing research on the many works I inherited from my mother’s studio. Up until now there has never been the time. But I am retired now and have some new information. For a time, when my mother partnered with a Mrs. Schreiber, there were several other women who did illustration. And this sketch is by one of those women. When compared to my mother’s work it is the head that gives it away. The females my mother drew had larger heads with less detail. My mother’s work would never have all the fussy detail. So I’m afraid this sketch goes back to the “Mystery” category. Would you like me to send an example of my mother’s work?